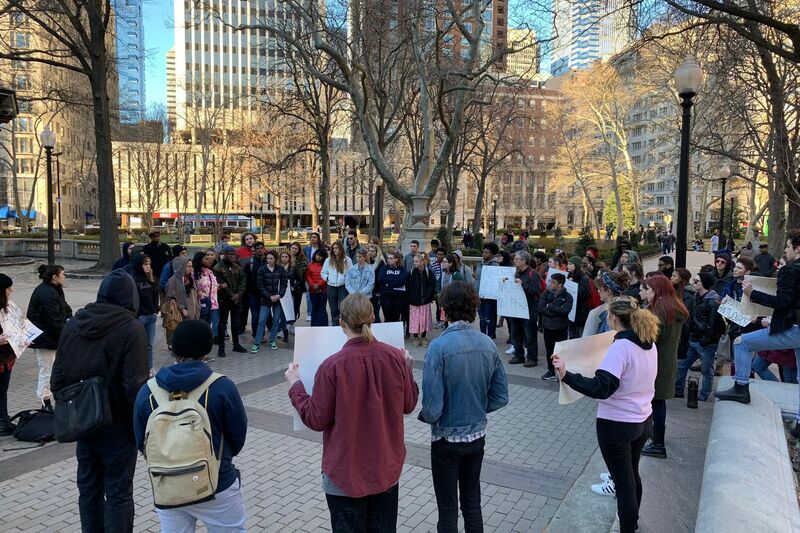 A group of nearly 100 protesters gathered in Rittenhouse Square Saturday afternoon to speak out against the trial of the former East Pittsburgh police officer who shot and killed 17-year-old Antwon Rose II last year. The shooting, which was captured on a bystander’s cell phone and circulated widely, occurred after Rosfeld pulled over a car in which Rose had been a passenger for a traffic stop. The car matched the description of a vehicle that had been involved in a drive-by shooting only minutes earlier. Upon being stopped, Rose and another teenager fled, and Rosfeld opened fire. Rose was declared dead at a local hospital. He was unarmed. The speak-out in Philadelphia came only a few hours after Rose’s father pleaded for peace at a vigil 300 miles away in Pittsburgh. Speaking in front of more than 100 people, Antwon Rose Sr. encouraged attendees to head to the polls in order to spur change. His entreaty followed a night of protests in Pittsburgh, during which gunshots were fired through the window of Rosfeld’s attorney’s office. Keely Brady, a 19-year-old student at the University of the Arts, organized Saturday's protest. Philadelphia’s gathering, hosted steps from the Rittenhouse Square fountain, started small as it began around 5 p.m., as a handful of participants made signs with markers that said phrases, such as “He Was Seventeen," “No Justice, No Peace,” and “#JusticeForAntwonRoseII." Yet within an hour, the gathering had swelled to more than 100, all of whom stood in a large circle, singing together, hoisting signs into the air, and speaking about their experiences. The death of Antwon has become the latest flashpoint in a national conversation about the kind of force police are using — particularly against African-Americans. Protests against police violence have swept the country in recent years after numerous black men, many times unarmed, have been killed by officers. The rally, which lasted about 90 minutes, remained peaceful throughout. Several police officers were present at a distance on the perimeter of the square. Brady, a student at Philadelphia’s University of the Arts said in an interview before the gathering that she felt compelled to organize a rally after reading about the verdict. Originally from Pittsburgh herself, she said she wished she could have been home to protest. She encouraged attendees to speak about their own experiences, saying it was “not [her] story" and that “this is not something I can ever understand on the level that other people do." Not long after, 20-year-old Maya Rimpsey spoke. Moments later, one attendee silently rose a sign above her head. “Am I Next?" it said.